Also I am looking at putting on an early evening class at the Michelin on a Thursday 6-7pm – at the moment a Pilates/Yoga combination seems very popular … further feedback will be appreciated. 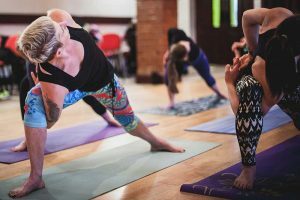 I’m thinking of a class which combines both elements (yoga & pilates) – using the music to flow through dynamic stretch sequences and controlled body conditioning elements, targeting specific areas of the body. End result body and mind strengthened yet relaxed ….